Voltage Transformers manufactured and supplied by Servokon is the most preferred transformer over conventional stabilizers. This is due to the fact that the stabilizers have relays that are when switched leads to an interruption in output voltage for a short time. This can cause damage to the electric equipment like computers and others. Voltage Transformers ensures complete protection against spikes and also provide the controlled output voltage. 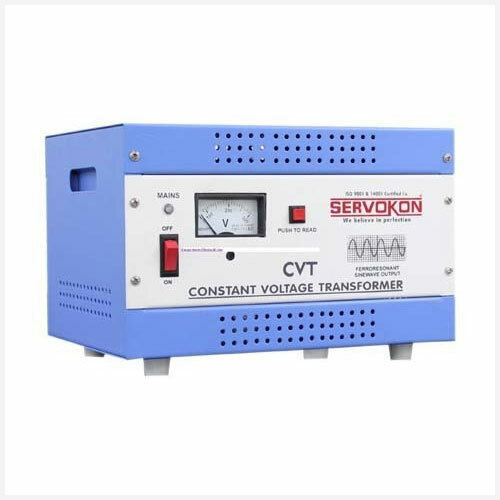 Servokon, a renowned manufacturer manufactures the Voltage Transformers with fellow resonant technology; placing its winding separately. We have a highly qualified team of professionals for ensuring that the transformer is manufactured at par with the standard norms and according to the specific requirements of the customers. The transformer has been widely demanded in Bio-med types of equipment, Fax, Telecom Equipment, Color photography lab, High Sensitive machines and many other industries.